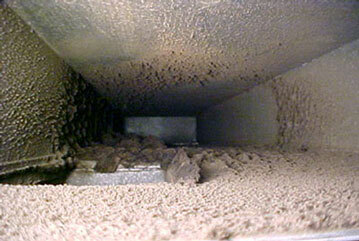 Michigan Air Duct Cleaning for dust, dirt, pollen, animal dander and other airborne contaminants. While these are pulled into your duct system every time, the furnace or air conditioner runs. These contaminants build up inside the air ducts over time. The particles can help make your duct system an ideal breeding ground for fungus, mold spores, mildew and other microbes. Each time the furnace or air conditioner turns on contaminants spewed out and circulated throughout your home. Consequently, this can affect the health and comfort of your family. Also, the removal of contaminants from the entire air distribution system is necessary so that fungal regrowth will not occur. Deep clean the source of the air supply including (where applicable) the blower, squirrel cage, coils, condensation pan and return air supply. The air ducts are scrubbed and vacuumed clean with our patented Rotobrush System. 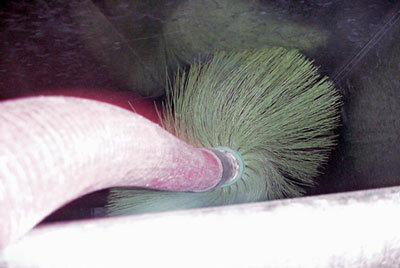 The Rotobrush removes various contaminants that circulate through the air duct system. We will sanitize your air ducts and vents with an environmentally safe sanitizer commonly used in hospitals and nursing homes, leaving behind a fresh scent. One piece of equipment that our company uses is our Rapid Air Purifier (photo hydro ionization) unit. This unit has two technologies designed to operate 24 hours a day. Also, provides clean air in building up to 3000 Sq. Ft. Furthermore, it reduces bacteria, molds, microbes, and odors with a unique advanced oxidation process. Also, it emits cleansing ions when UV light interacts with the Tri-metallic Catalyst. Through this process, ozone converts into hydroperoxides. They are 20 to 40 times more efficient against microbial and gasses than ozone. Also, to stay within the EPA suggested levels of ozone emissions in occupied spaces, this technology incorporates the Tri-metallic Catalyst. Furthermore, it provides a targeted solution for indoor air purification and prevention of damaging odors, mold, and mildew. After 3 to 4 days of use, dust soot and airborne particles start dropping out of the air. Due to the electrons causing the positively charged particulate matter to take on a neutral charge and fall out of the breathing space due to gravity. You can remove particles by wipe or vacuum thus reducing the damages caused by soot and fire. Along with our Rapid Air Purifier units, we also offer large air scrubbers, negative air machines, a Rotobrush duct cleaning system, and ozone machines for use on any claim encountered by an insurance adjuster in the field. Our knowledgeable staff, in combination with the equipment and training, will no doubt help reduce the cost of every-day claims, whether the damages are structural or to contents.